WE tackled county councillor Andrew Davis about the narrowness of the new carriageway in the Market Place, which is in his electoral division. Mr Davis told us that he had been contacted by others about this, had investigated the matter and been told that the new carriageway will meet the Government guidline width . As a member of the administration running County Hall we weren't expecting cllr davis to be too critical - but we can be 'IT ISN'T WIDE ENOUGH AND WILL PROVE A DANGER TO CYCLISTS'. WE are all being encouraged to get on our bikes to save ourselves and the environment but doing that is about to become a whole lot more dangerous in the centre of Warminster. Visionforwarminster.co.uk has been approached by a number of people who regularly cycle in the town centre - one man has been using his bike to cycle along the street to get to work since 1967. But he is worried that the new town centre arrangements will force many pedal cyclists off the road, lead to accidents and road rage. The problem is that the new carriageway will become so narrow when the work is finished that there will be insufficient room for a vehicle to pass an eastbound cyclist in safety for about a 100 yard stretch. Some cyclists will have the strength of character to cycle in the middle of their lane for the whole distance to the annoyance of motorists behind, while others will keep to the left and leave themselves vulnerable to being hit as drivers edge them off the road or they will dismount or take another route. “I’m glad that these people have alerted me to this matter and I will be taking it up with the authorities to see if something can be done to alleviate this problem at this late stage,” said former county councillor Steve Dancey. 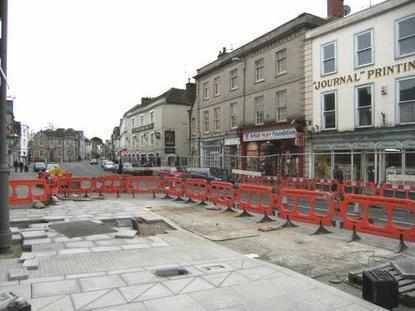 The county council has spent considerable sums to help improve cyclist safety, sometimes with dubious results in Warminster. "This lack of consideration for cyclists once again shows a real need for a proper town appraisal of the needs and aspirations of all of us," added former councillor Paul Macdonald. "Where is the proper feedback going to come from. The modern 'scoping' using simplistic and frankly insulting lazy publicity stunts or real attempts to involve our knowledgeable community?" PAVEMENT WATCH: The work on the north side of the street is nearing completion so now the attention will switch to the other side of the road.